Often, I get asked about my favorite chair in our home. With it’s exposed back and distressed frame – people inquire as to where we bought these comfy high back chairs. The deconstructed frame only adds to the charm of these 19th century wingback chairs. The burlap back and tufting threads are part of the chair’s uniqueness. Most days, you will find me curled up on these cozy chairs with a cup of hot tea. We were fortunate enough to purchase two of these beautiful chairs from Restoration Hardware. But I have a secret for you…come closer….(shhh)! You can score this identical chair at half the price (HERE)!! I kid you not!!! That’s right..half! If I had known about this, I would have bought mine from Soft Surroundings too!! I really hate to throw my beloved RH under the bus but HEY..who isn’t looking to save money? RIGHT?! And if I see a great deal…I have to share it with you all..my readers. Check out their other furniture pieces, you will fall in love with their style. 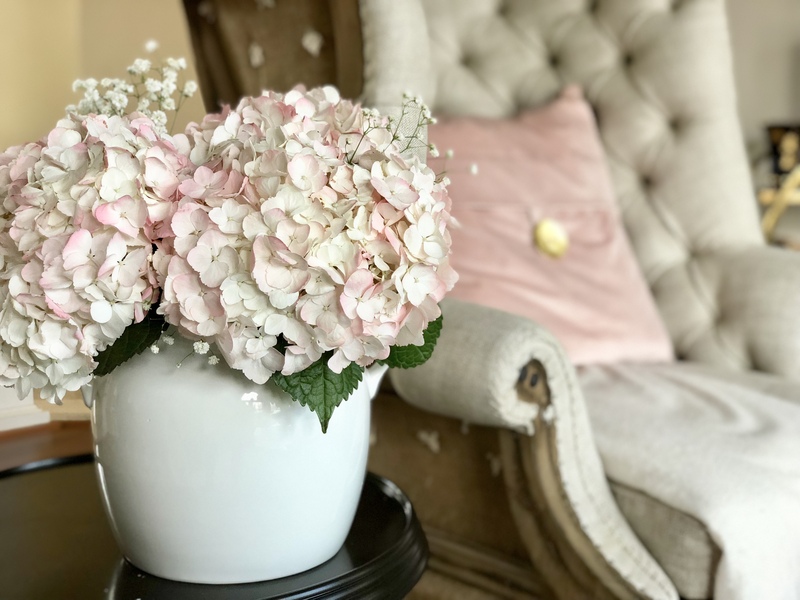 For more home decor inspiration, subscribe to Happy Haute Home and follow along on Pintrest HERE, and Twitter HERE and feel free to pin and tweet your favorite pics from Happy Haute Home. well it feels more like a flower post at first – but then I see the way that you led into the full and clear version of the chair – brilliant – and nice colors here. Thank you! I like to incorporate flowers as much as possible in my posts. I truly love all of your post and your interior decorating savviness and inspirations! Simply Beautiful!! Thank you Toya! I appreciate your sweet comments and am so happy you visit! I am just here to say I love the colors, but that fireplace in the middle is such a great design element and placement on your end!! Yea, size can be tricky..even with RH. They have a selection of very small chairs that appear large in a picture but once you see them in person, they are tiny! I guess it’s the style? Tiny chairs won’t work in my house…they would look like doll furniture! Thanks for popping in Lynn!